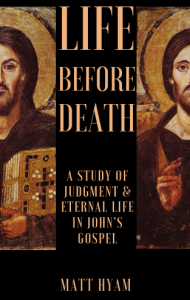 Many Evangelical Christians state that, if it were not for hell, they would not be a Christian, but was the threat of judgment part of Jesus’ gospel invitation? Is fear really a good reason to be a Christian? Are we, as this statement implies, jealous of a hedonistic lifestyle? Does Jesus invite us to a receive a ticket to heaven, or is eternal life something more than this? – Brad Jersak (PhD), author of A More Christlike God. – Stuart Murray, author of Post Christendom. Life Before Death is available in UK from online booksellers, such as Amazon, Blackwells or the Book Depository or from the SVC bookshop. If you are overseas, this should also be available from online retailers. I Still Have More Questions Than Answers” is Matt’s attempt to document the process and its implications. While his intention is not to be controversial or confrontational, he believes that there are several fundamental questions about the church and discipleship that need to be addressed if believers are to fulfil their biblical mandate in this new millennium. 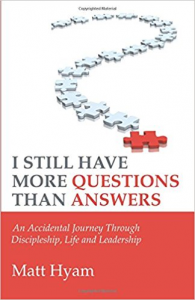 Matt recognises that these are not easy questions, but challenges his readers to ask them and embrace their own journey of discovery with God. – Dr Bradley Jersak, Author of A More Christlike God. – Rt. Rev Todd hunter, Diocese of Churches for the sake of the Lost; former President, Alpha (USA). – Simon Van Niekerk Former Pastor, City Vineyard, Cape Town. – Eric Sandras, Lead Pastor of Sanctuary Church, Colorado Springs, CO; author of Buck Naked Faith. The book is published by Wipf and Stock and is available in the UK from online booksellers such as Amazon, Blackwells, Eden, Wordery, Waterstones or the Book Depository or from the SVC bookshop. If you are overseas, you should be able to buy it from most online retailers.